Easter Sunday. Trains are on strike. The railway line between Patras and Kiato is not functional but the train company operates buses to villages along the route. Like to Diakopto, my destination. 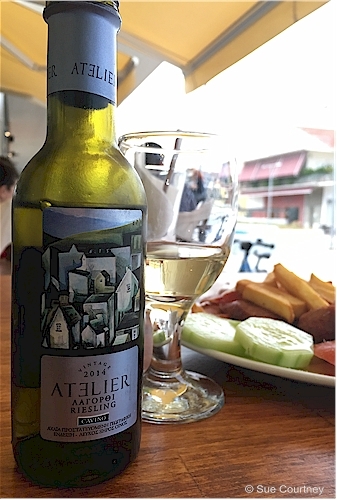 My plan was to head there first thing and transfer to the tourist train that runs on a cog railway up into hills and the village of Kalavryta, a ski resort village in the winter. Oh, what am I to do? I contact the hotel owner where I am booked in. “Catch the Ktel bus to Ayio, then a taxi to Diakopto. The tourist train will be running tomorrow.” A taxi. Yes. I am not going to hitch-hike again. The Ktel buses in Greece are very comfortable. The rides so far have been very smooth. There was a taxi at Ayio and I haggle a 2 euro discount on his originally stated 20 euro fee. The driver drops me at the hotel door. Hotel Chris Paul is surrounded by citrus trees. It’s quiet. No traffic. The birds are happy. Fire crackers occasionally interrupt the peace. My room has a wee balcony and looks onto a courtyard where in the middle is what looks like a weeping willow tree. 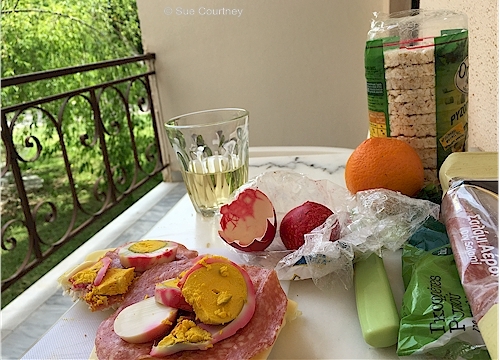 I get out my lunch of rice crackers, salami, cheese, red eggs from Christophe at Domaine Mercouri plus an orange from the hotel orchard and a 375 ml bottle of wine I paid 5 Euros for in Pyrgos. The manager who wasn’t around when I arrived comes to say hello. I comment how good his English is. He’s Greek Australian. He hopes his instructions to get here without the Trainose bus were OK. They were. He comes back with a small plate of beautifully tender lamb shoulder chops and some potatoes. I eat the fat and all. It’s crispy and falls off the bones. Wonderfully tasty. He has booked me a ticket on tomorrow’s 11.15 am train. I’ll do some washing then explore Diakopto. It is only about 200 metres to the railway station and another kilometre to the sea. Then I think I will have a deserving siesta. I follow the road to the coast, crossing the railway line at the station where I will catch the train tomorrow. 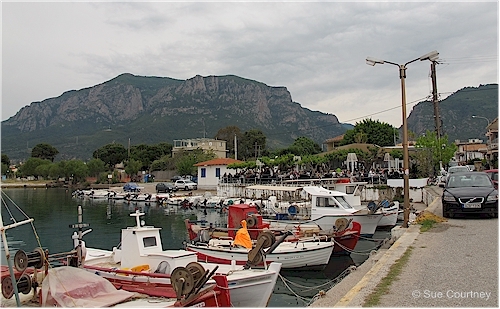 There is a small boat harbour at the end of the road and a packed café. I walk along the coast road right next the sea. The tide is in. Perhaps it never goes out. My GPS guides me back to the station. I smell flowers, heady at times – I find out later it is jasmine; I smell clay – with an earthy wet concrete tone like some of the Greek toilets have; I smell smouldering embers from the spits for the Easter roast lamb; I smell rubbish stink from the communal bins the residents share; I smell coffee at the ouzerie; I smell exhaust fumes. I see fruit including oranges / lemons / loquats / olives and figs still green and I see flowers including hibiscus / bottlebrush / irises / bird of paradise / privet hedges / jasmine / bougainvillea / geranium and poppies. I hear birds / motorbikes / lapping of the water on the shore road wall / voices / a dog barking / children shrieking as they race each other on bicycles / a football being kicked / throbbing of an engine / tyres on the gravel / voices gabbling away in Greek / chickens gaaw gaaw-ing as they pull out grass / geese honking – at me. I hear the pattering feet of a dog. The dog is with a man who says yahsas. I say kalispera. He knows I am English and asks me where I am from. Nea Zealandia I say. He nods. The cafe at the station is busy. Lots of people drinking coffee. Not many people eating. I see people leaving and swoop on an empty seat. I order a sub-like sandwich without the bread, just lettuce, tomato, cucumber, sausage, bacon and chips. And a glass of krasi. So the trains are on strike. But lucky me. I experienced so many things I would have missed. I’ve enjoyed my enforced Easter Sunday sojourn in Diakopto. Life could be worse. 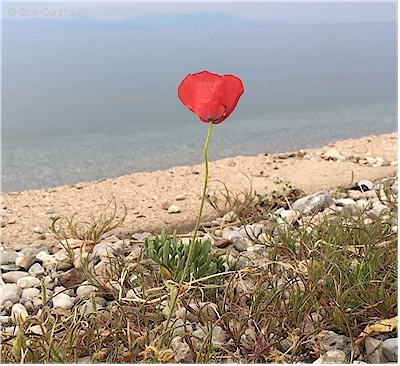 This entry was posted in Greece, Travel and tagged Diakopto, Patras by Sue Courtney. Bookmark the permalink.